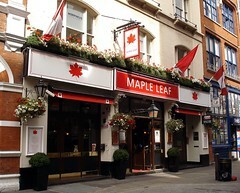 As you'd expect from the name, this is a Canadian-themed pub in Covent Garden, near the Strand. They subtitle themselves as a "sports bar and grill". This place is fairly large and, though not quite as raucous as its close Australian-themed neighbour Walkabout, is still fairly crammed with young Canadians and tourists. High tables and stools towards the front give way to curved banquette seating further back, and sport is shown on flatscreens. The decor is the kind of stuff you might expect — Mountie uniform, ice hockey equipment, a rather small stuffed moose, some kind of log-cabin effect. They do have a few handpulls for real ale; London Pride and Greene King IPA in March 2008, and Marstons EPA and Bombardier in May 2011. They also have some Canadian lagers on tap, like Labatt's (avoid it) and Sleeman Honey Brown Lager (£2.15/half as of May 2011), which isn't bad at all. There are bottled Canadian lagers too, and the wine list ranges from £12-15 a bottle (as of March 2008). Food is served at least in the evenings and lunchtimes. Staff hover around the tables expectantly to take your order if you wish for some "bourbon wings" (£5 as of May 2011), poutine (chips with melted cheese and beef gravy; £4.45 as of May 2011), or any of the mains (ranging from £7-14 as of May 2011) or other light snacks. Dean tried the food in July 2008; the wings were excellent, and the fish came in two sizes — large and monster movie — although the chips were very dull. On another visit in May 2013, Dean and bob both had the venison and blueberry burger photo which was slightly disappointing. A side of chicken wings wasn't great either. Accessibility: A step to get in. Toilets are down a flight of stairs with a bend at the bottom and a handrail most of the way down. Last visited by bob and Dean, May 2013. Last edited 2014-09-29 19:14:01 (version 16; diff). List all versions. Page last edited 2014-09-29 19:14:01 (version 16).